The art patron Charles Ephrussi (1849 –1905), one of the Parisians on whom Proust based the character Swann, was deeply appreciative of contemporary painting, and agreed to buy from Edouard Manet the delightful still-life, topmost above, for 800 francs. So great was his pleasure in ownership, however, that he paid the artist 1000 francs for it. 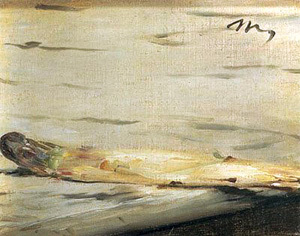 Not one to miss the chance for a witty flourish, Manet swiftly sent Ephrussi a smaller painting, of a single asparagus, with a note to say that one had slipped from the bunch. Both paintings may be viewed by the public, but not together. The mother painting is in the Walraff Museum in Cologne, the solitary asparagus in the Musee D’Orsay in Paris.